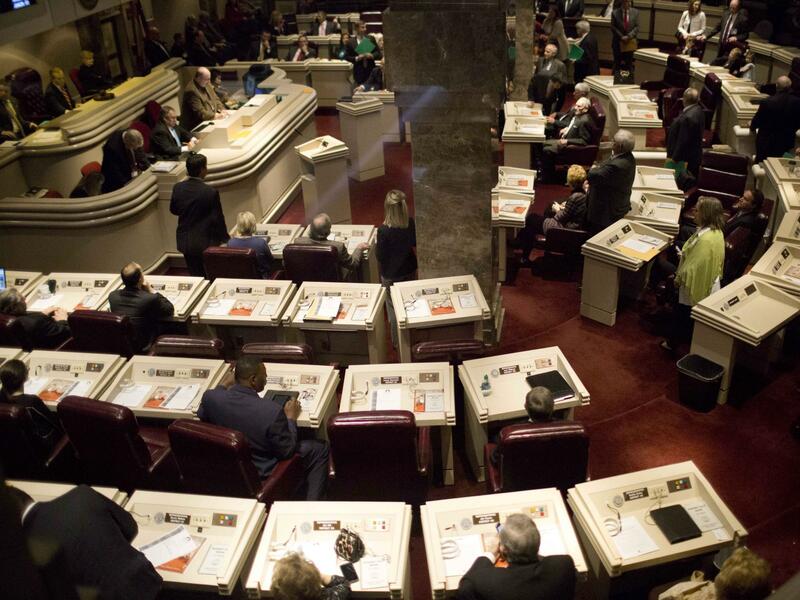 State representatives work in the house chambers at the State House in Montgomery, Ala. A federal appeals court sided with workers from Birmingham, Ala., who argued that state lawmakers racially discriminated against the majority-black city by blocking a minimum wage hike. The case — filed by a group of fast-food workers, the NAACP and other worker groups — argued that the state's majority white legislature discriminated against the majority black city. On Wednesday, the 11th U.S. Circuit Court of Appeals agreed, reversing a judge's earlier decision to dismiss the workers' suit. In its decision, a three-judge panel ruled the state's preemption law violated 14th Amendment's equal protection rights. It called the state's actions "rushed, reactionary, and racially polarized." This is just the latest development in a kind of cat-and-mouse game has been raging between cities and states for the last few years. Cities or counties with higher costs of living have increasingly adopted minimum wage increases well above the federal minimum of $7.25 an hour. Then state legislatures fight back by setting statewide caps. This is known as state preemption. According to the National Employment Law Project, a worker advocacy group, 25 states have passed preemption laws. In 2016, the group of Birmingham workers became the first city in the country to file suit. This latest ruling does not mean the wage hike will take effect; it only means the workers will likely be able to take their case to court. An eventual ruling on their underlying case could have major implications for workers in other cities locked in similar battles with their state lawmakers. "The voices of low-wage workers in Birmingham were heard," said Scott Douglas, executive director of Greater Birmingham Ministries, one of the parties to bring the suit. He says the state legislature abused its power. "Where that comes from is Alabama's history of denying black-controlled counties and cities the right to home rule," or local self-governance, he says. The issue of local control is a big one, and not just on the issue of the minimum wage. Laura Huizar, a staff attorney for the National Employment Law Project, says state preemption is very controversial because it affects a whole range of policies — including gun regulations, anti-discrimination and paid-leave laws, and bans on plastic bags. "More and more local leaders and local communities are realizing that they have to stand up and defend their local rights, or all of these state preemption bills are going to erode their ability to practice and exercise local democracy," Huizar says. The crux of the Birmingham court battle — and similar cases out of Minneapolis and Miami Beach — is fundamentally a legal question; it's a fight over whose law should prevail. There is also a separate, economic debate about the impact of raising the minimum wage in cities — and who benefits. Those in favor of raising the minimum wage argue it puts more money into workers' hands, which helps both families and businesses. It's not that simple, says Michael Strain, a scholar at the American Enterprise Institute. He says a city risks driving employers out into surrounding suburbs by increasing their cost of doing business. "You have the kind of classic trade-off, where there are reductions in employment among minimum-wage workers, but minimum-wage workers who get jobs and keep jobs end up bringing in more money," he says. Meanwhile, the group of Birmingham fast-food workers who brought the case must wait for the next stage of the legal fight. Two years ago, the city of Birmingham, Ala., voted to raise its minimum wage to $10.10. But before the hike could take effect, the state legislature passed its own law barring municipalities from setting their own minimum wage. This week, a federal appeals court handed Birmingham's workers a big win. They're the first to score a victory over a state in the fight over minimum wage laws. NPR's Yuki Noguchi reports. YUKI NOGUCHI, BYLINE: A kind of cat-and-mouse game has been raging between cities and states for the last few years. It goes something like this. Cities or counties with higher costs of living vote to raise their minimum wage above the federal minimum of $7.25 an hour. Then state legislatures fight back by setting statewide caps. This is known as state pre-emption. So far, 25 states bar local governments from setting a separate minimum wage. When this happened to Birmingham, worker advocates in the city became the first in the country to sue the state. They argued that Alabama's majority white legislature discriminated against the majority black city. This week, the 11th Circuit Court of Appeals agreed, reversing a judge's earlier decision to dismiss the workers' suit. SCOTT DOUGLAS: The voices of low-wage workers in Birmingham were heard. NOGUCHI: Scott Douglas is executive director of Greater Birmingham Ministries, which sued the state along with the NAACP and a group of fast-food workers. In its decision, a three-judge panel ruled the state's pre-emption law violated equal protection rights. It called the state's actions, quote, "rushed, reactionary and racially polarized." DOUGLAS: Where that comes from is Alabama's history of denying black-controlled counties and cities the right to home rule. NOGUCHI: Home rule meaning local self-governance. This doesn't mean the city's wage hike now takes effect. It just means the Birmingham workers can argue their case in court. But how the courts ultimately rule will have major implications for workers in other cities locked in similar battles with their home states. Laura Huizar is a staff attorney for the National Employment Law Project, a worker advocacy group. LAURA HUIZAR: Well, I think the decision opened the courthouse doors in a new way for Birmingham and potentially other cities that are considering this type of action. NOGUCHI: Huizar says state pre-emption is very controversial, and not just because of how it could affect minimum wage. States are also using similar laws to bar cities from other kinds of legislation from gun regulations to antidiscrimination laws to bans on plastic bags. HUIZAR: More and more, local leaders and local communities are realizing that they have to stand up and defend their local rights or all of these state pre-emption bills are going to erode their ability to practice and exercise local democracy. NOGUCHI: The crux of this court battle is political. It's a fight over whose law should prevail. Separately, there is also a debate about the economic impact of raising the minimum wage and who benefits. Those in favor say it puts more money in people's pockets, which benefits both families and businesses. But Michael Strain says it's not that simple. Strain is a scholar at the American Enterprise Institute. He argues a city risks driving employers out into surrounding suburbs by making it more expensive to run their businesses. MICHAEL STRAIN: So you have the kind of classic tradeoff where there are reductions in employment among minimum-wage workers, but minimum-wage workers who get jobs and keep jobs end up bringing in more money. NOGUCHI: Meanwhile, the group of Birmingham fast-food workers who brought the case must wait for the next stage of the legal fight. Yuki Noguchi, NPR News, Washington.